Q: Why get vaccinated against the flu? A: Influenza is a serious disease that can lead to hospitalization and sometimes even death. Every flu season is different, and influenza infection can affect people differently. Even healthy people can get very sick from the flu and spread it to others. Q: How do flu vaccines work? A:Flu vaccines cause antibodies to develop in the body about two weeks after vaccination. These antibodies provide protection against infection with the viruses that are in the vaccine. The seasonal flu vaccine protects against the influenza viruses that research indicates will be most common during the upcoming season. Q: What kinds of flu vaccines are available? A:Traditional flu vaccines (called trivalent vaccines) are made to protect against three flu viruses; an influenza A (H1 N1) virus, an influenza A (H3N2) virus, and an influenza B virus. In addition, this season, there are flu vaccines made to protect against four flu viruses (called “quadrivalent” vaccines). These vaccines protect against the same viruses as the trivalent vaccine as well as an additional B virus. Q: When should I get vaccinated? A: Flu vaccination should begin soon after vaccine becomes available, ideally by October. Q: Does the flu vaccine work right away? A: No. It takes about two weeks after vaccination for antibodies to develop in the body and provide protection against influenza virus infection. That’s why it’s better to get vaccinated now, before the flu season really gets under way. Q:Why do I need a flu vaccine every year? A:A flu vaccine is needed every season for two reasons. First, the body’s immune response from vaccination declines over time, so an annual vaccine is needed for optimal protection. Second, because flu viruses are constantly changing, the formulation of the flu vaccine is reviewed each year and sometimes updated to keep up with changing flu viruses. Q: Who should get vaccinated this season? People who are at high risk of developing serious complications, like pneumonia. Q: Who should not be vaccinated? Q: Can the flu vaccine give me the flu? 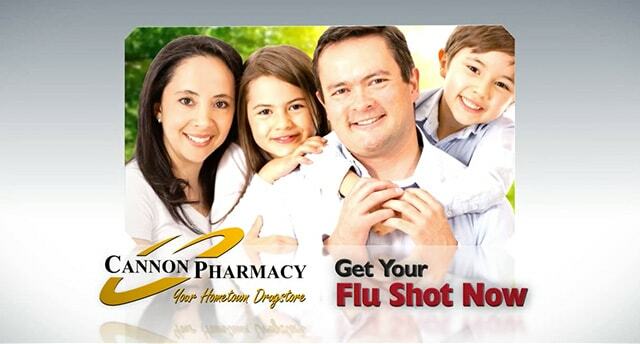 Q: What insurance does Cannon Pharmacy accept & what is the flu vaccine copay? A: Check with Cannon’s friendly staff to find out specific coverage details. Traditional Medicare and Medicare Advantage Plans have a $0 copay. Medicaid recipients must go through their doctor’s office, local health department, or pay out of pocket. Q: Without insurance, what is the cash price? Q: Does our flu shot contain preservatives? A: No, our flu shot is preservative free. For full details, download the Flu Shot PDF. Copyright © 2019 Cannon Pharmacy. All Rights Reserved.